Photographs or drawings of 'Newstead' were exhibited at the Glasgow Institute of the Fine Arts in 1914. In 1915, photographs of the house were exhibited at the Royal Scottish Academy and published in the July volume of Academy Architecture and Architectural Review. The house was also illustrated in the Builder in 1915. 3 Comparison of the 1915 photographs with the house now named 'Pinehurst' proves they are same building. Alternative names: Newstead 5 . 1: Historic Scotland, listing description 22168, 'Camstradden Drive East, Pinehurst with terrace walls' (listed in 1994), www.historic-scotland.gov.uk [accessed 14 January 2013]; Miles Glendinning, Ranald MacInnes and Aonghus MacKechnie, A History of Scottish Architecture: From the Renaissance to the Present Day, Edinburgh: Edinburgh University Press, 1996, p. 573. 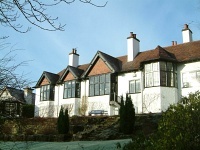 The listing description in fact attributes the house to 'Keppie and Henderson, c. 1912'; the practice name was Honeyman, Keppie & Mackintosh until the beginning of 1914. 2: O.S., Dumbartonshire XXIII.12 (County Series 1:2500, 2nd revision, surveyed 1914, published 1923); 'Newstead', Dictionary of Scottish Architects, 1840–1980, www.scottisharchitects.org.uk [accessed 14 January 2013]; 'Pinehurst', Dictionary of Scottish Architects, 1840–1980, www.scottisharchitects.org.uk [accessed 14 January 2013]. 3: 'Newstead', Dictionary of Scottish Architects, 1840–1980, www.scottisharchitects.org.uk [accessed 14 January 2013]; Glasgow Institute of the Fine Arts, 1914 (141); Edinburgh, Royal Scottish Academy, 1915 (596); 'Academy Architecture 1915 II. Scotland. Edinburgh Royal Academy Exhibition', Academy Architecture and Architectural Review, 38, July 1915, pp. 60–2; Builder, 108, 1915, pp. 595–7. 4: Historic Scotland, listing description, 22168, 'Camstradden Drive East, Pinehurst with terrace walls' (listed in 1994), www.historic-scotland.gov.uk [accessed 14 January 2013]; Miles Glendinning, Ranald MacInnes and Aonghus MacKechnie, A History of Scottish Architecture: From the Renaissance to the Present Day, Edinburgh: Edinburgh University Press, 1996, p. 573. 'Newstead', Dictionary of Scottish Architects, 1840–1980, www.scottisharchitects.org.uk [accessed 14 January 2013]; 'Pinehurst', Dictionary of Scottish Architects, 1840–1980, www.scottisharchitects.org.uk [accessed 14 January 2013]. 5: 'Academy Architecture 1915 II. Scotland. Edinburgh Royal Academy Exhibition', Academy Architecture, 48, July 1915, pp. 60–2.